I'ma thinking a nice jaunt up through Globe, Salt River Canyon, Showlow and then back through Snowflake, Heber, and Payson just might be pretty much fun. Leave the Chevron at Idaho Rd and the 60 at 8am, breakfast/lunch in Showlow. (150 mi to Showlow) No rain, or snow, forecasted for Sunday. We’ll be there. See you at Idaho Rd at 08:00. I'll be there. If she is feeling better, Lisa will too. Hope Lisa does feel better. Vicky won't be so bored by just having men to talk to. Cobra Make, Engine: ACE, 351W, 3550 Tremec, Raging(?) Red W/ White Stripe. Planning on going! What happened to the rest of the gang? We can't make it. Old and cracked windshield out. Doubt new one by tomorrow. Have fun! Last edited by Scotchman; 04-12-2019 at 07:36 AM.. I hope they went a different direction. It's snowing in Pinetop. Last edited by Danr55; 04-14-2019 at 03:35 PM.. I hope they went a different direction. It's snowing in show low. Dan you feeling okay? I just checked NOAA / National Weather Service and the 3 pm report for Show Low was fair and 64F. I erred. I just got s note from a friend in Pinetop. Said it was snowing. I will check back. The title on the email says " It's snowing outside". The cabin is in Pinetop. What he didn't say was that the vid was shot in February. 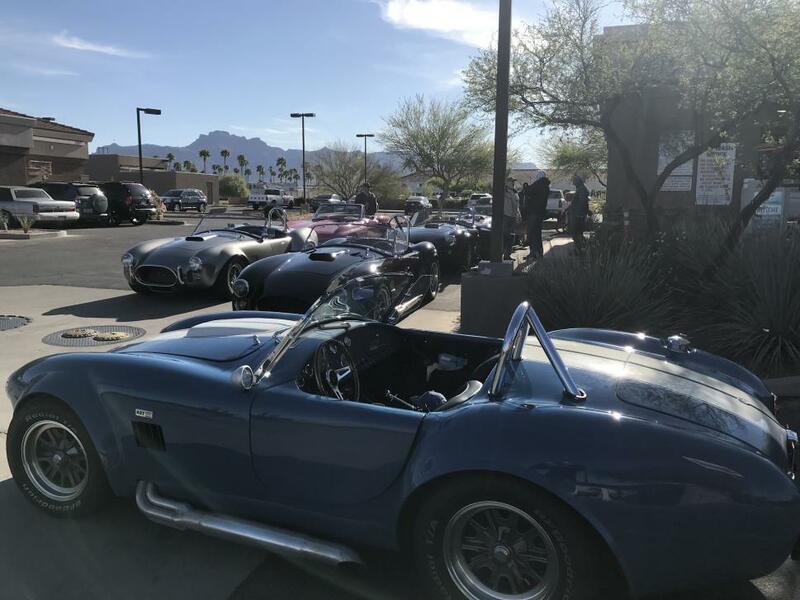 Last edited by Danr55; 04-14-2019 at 03:44 PM..
We never went to Show Low- we ran up to Globe, then through Salt River Canyon, then 180'd back through the canyon to Globe for lunch, then the Westside/Northside guys ran north for Roosevelt/Beeline, while the Eastsiders came back down the hill on the US60. Fun Run ! A cop between Globe and Superior turned on his lights to slow us down on the way home. Always exhilarating on these runs ! Certainly was an outstanding ride. Beautiful weather, minimal traffic, very few LEOs. All good. Geeez Rob, at first thought that maybe a little dangerous putting a (Stingray) in the middle of those Venomous Snakes, but then a Stingray has a little venom at the tip of it's tail too Glad to hear you boys had a "Safe & Fast" trip. Cheers Rusty Tommy Rotten ! Or I may just go with RTR? What do you think Karl, Dan ?